Attorney Edgar Snyder ’63 was among those honored on Tuesday evening. Seems like every October, I go to the Alumni Fellows dinner half-thinking, “Here comes another banquet” … and every year I come away impressed with the people being honored and the heartfelt things they say. Tuesday night was no exception. In the course of the evening, the Alumni Association and the academic colleges honored 19 Penn Staters—men and women who have accomplished some pretty cool things. There was a guy who commissions new operas for the Metropolitan Operas, a guy who worked with Penn State to develop a better softbox for pole vaulting, the co-founder of a national patient-advocacy organization, and lots more. The themes that echoed throughout their remarks were humility and gratitude and, especially, pride in Penn State. In some ways it felt perfectly normal and ordinary to hear people say how much Penn State has meant to them, but then you realized how good it felt to hear those things after the year we’ve all been through. The best-known of the honorees was probably Edgar Snyder ’63 (pictured above), who is well known to anyone in western or central Pennsylvania who has a TV. His ads for his personal-injury law firm are everywhere. But while he’s best known for saying, “And remember—there’s never a fee unless we get money for YOU,” he also does an enormous amount of community-service work and philanthropy, both for Penn State and in Pittsburgh. Brigadier general Dana Born ’94g. Snyder called himself “privileged” to have received the Alumni Fellow award, and you could tell he meant it. 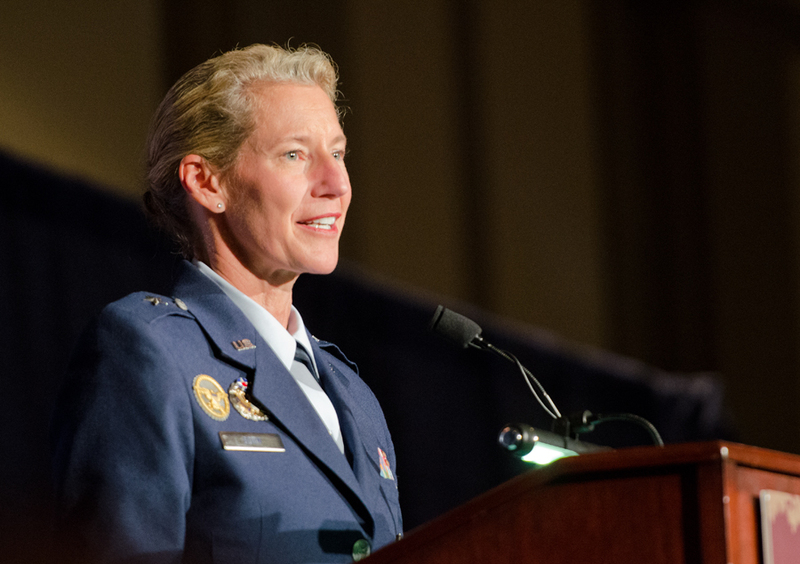 —Dana Born ’94g (see photo above), a brigadier general and dean of the faculty at the Air Force Academy, thanked psychology prof Rick Jacobs: “You took me in as a gamble,” she recalled. —Lisa Hook ’83g, president and CEO of an information and analytics company called Neustar, graduated from Dickinson law school when it was still “proud and independent”—that is, before it became a part of Penn State. But she has grown fond of her adopted alma mater: “Penn State is an absolutely awesome institution,” she said. “I could not be more grateful.” She joked that Dickinson law students today are “smarter, taller, and better looking” as a result of the merger. 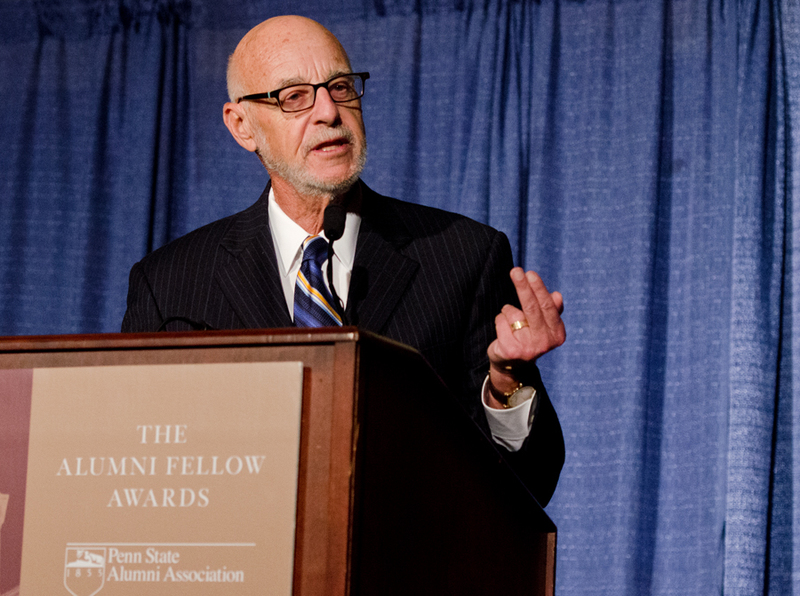 A number of the awardees made reference to the ongoing troubles at Penn State, with several making a point to say that their support for the university is stronger than ever. Many of the award recipients also thanked their families, of course. John Myers ’60, who worked first in engineering manufacturing and now is an operating partner in a private equity firm, noted that his family had moved 12 times in support of his career. Douglas Evans ’86, ’93g, CEO of Kensey Nash Corporation, read a poignant essay that his 13-year-old son wrote when the boy had leukemia. One of the most special honorees, to my mind anyway, was Lindiwe Sangweni-Siddo ’93 (pictured at right), who traveled all the way from Johannesburg, South Africa, to receive her award. Sangweni-Siddo built and became GM of the Soweto Hotel on Freedom Square, the first black-owned and managed four-star hotel in Soweto. Today she’s managing director of the Birchwood Hotel and OR Tambo Conference Centre, and co-owner of the Soweto Hotel & Conference Centre. She’s also a board member of the Global Philanthropy Alliance, a non-profit that supports young entrepreneurs in South Africa, Kenya, and Nigeria. You get the sense that she’s making quite a difference in the world. On a personal note, it was a fun surprise to see former Penn State dean Anne Petersen at the Fellows dinner. I worked for Anne in the late 1980s and early 1990s when she was dean of the then-newly formed College of Health and Human Development. 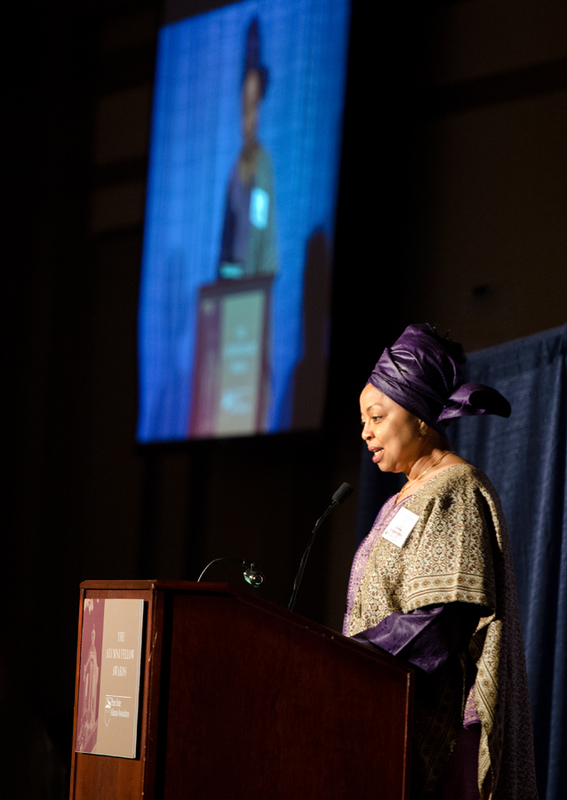 She left Penn State to go to the Kellogg Foundation, and later founded the Global Philanthropy Alliance—the organization to which Lindiwe Sangweni-Siddo has devoted so much of her time. Anne and her husband, Doug, came in from Michigan to help honor Sangweni-Siddo. I think Anne and I hadn’t seen each other in 20 years, so that was a nice bonus to the evening. Anyway, it really was a proud night for Penn State. And, after the year we’ve had, we needed that. Entry filed under: Alumni Association. Tags: Alumni Fellows, Anne Petersen, Dana Born, Douglas Evans, Edgar Snyder, Global Philanthropy Alliance, John Myers, Kensey Nash, Lindiwe Sangweni-Siddo, Lisa Hook, Richard Spontak, Tawfik Sharkasi. A great evening filled with amazing alumni! So proud to be a Penn Stater! !